”Alexander III of Macedon” was born on July 356 B.C and died on June 323 B.C. He was the king of Macedon “the ancient Greek Kingdom”. Alexander the great was born on July 20, 356 B.C in Pella. He was able to unite Greece, conquered the Persian Empire and re-establish the Corinthian League. He was able to remove the Persian Empire, took Macedonian arms to India, in addition to establishing the foundations for the Hellenistic world. He also became the hero of the legend bearing only the sketchiest resemblance to his historical career. He died of Malaria in Babylon on June 323 B.C. 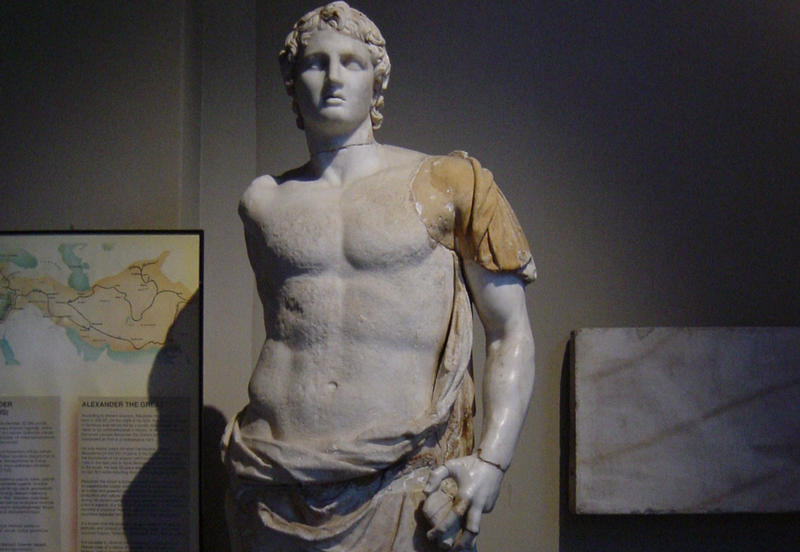 Alexander was the son of Philip II and was raised by a nurse. He was taught by Aristotle when he was 13 years old until he becomes 16 years old and the Temple of the Nymphs at Mieza was their classroom. He was so concerned with philosophy, medicine, and scientific investigation. The Thracian Maedi revolted against Macedonia during the absence of Philip as he waged war against Byzantion. Alexander colonized it with Greeks and established a city named Alexandropolis. Alexander was dispatched with a small force to subdue revolts in southern Thrace through his father. Philip returned to Pella and married from Cleopatra Eurydice. This made the matter difficult for Alexander the great because he had to go with his mother “Olympia” to her family in Epirus until they solve their problems and if his father got a child then it will be difficult for Alexander to reach the throne. Alexander’s father “Philip” exiled four of Alexander’s friends (Harpalus, Nearchus, Ptolemy, and Erigius). He also had the Corinthians bring Thessalus to them in chains. King Philip II was murdered by Pausanias, a Macedonian Noble Alexander was only 19 years old but he was determined to seize the throne by anyway. He got the support of the Macedonian army and as a result, the army proclaimed Alexander the Feudal King. Alexander arranged his army and went so quickly to Thebes that they didn’t have a chance to stop him and he led the massacre of Thebes three days after arriving. He started his Asiatic expedition in 334 B.C and arrived in Troy. He wanted to reach Tyre so he instructed his men to build a causeway. He realized that he needed a strong navy and finally he was able to get into the city in July 332 B.C. He also had a plan to conquer Egypt and after besieging Gaza, it was easy for him to conquer Egypt. Egypt fell in his hands without any resistance, he built the city of Alexandria in 331 B.C it is a Great place to visit through your Egypt tours Packages, and after that, he defeated the Persians at the battle of Gaugamela. Alexander became the King of Asia, Babylon, and the King of four Quarters of the world. Alexander the Great then started to create Macedonian colonies to conquer Iran. He captured prince Oxyartes and married his daughter, Rhoxana. He became injured in 328 B.C by Malli warriors and he recovered in 325 B.C. He reached the city of Susa in February 324 B.C and he tried to retain his leadership by connecting Persian Nobles to Macedonians to create a ruling class. To do so, he asked his soldiers to marry some Persian princesses at a huge wedding and he even took two wives for him. He dismissed many of his Macedonian soldiers after managing to join thousands of the Persian soldiers in his army. That’s why he tried to appease the Macedonian soldiers through killing 13 Persian leaders. He even headed to India in 327 B.C and he met king Polus, whose army had less experience than Alexander but they had an elephant as a secret weapon. After a fierce battle, Polus was defeated. There was a remarkable incident for Alexander in which his horse died and the reason of its death is unclear whether it died from the wounds of the battle or from its old age but it was so dear to Alexander that he named the city Bucephalus, which was his horse’s name. 1-Alexander used to play Polo that was sent to him by the Persian King to keep him away from war. 2-Polo was the oldest sport in the world and it was played by nobles and soldiers as well. 3-After his death, many legends and stories were being narrated about Alexander’s life and one of them is journeying to the bottom of the sea in a glass bubble to get into the land of Darkness in search of the Fountain of Youth. 4-We are almost sure how he looked like as he ordered during his reign to have a portrait of his own and thanks to this inscription, we actually know his accurate features. 5-The Phalanx was Alexander’s favorite military tactic, which was a formidable fighting machine. 6-Hephaestion was Alexander’s dearest friend and the general of his army. 7-When Haphastion died in Ecbatana, Alexander wrote to the oracle at Siwa asking them if his friend should be honored as a hero or a god. 8-They replied saying that he should be honored as a hero. 9-Alexander made a huge funeral for his friend. Alexander the Great died on June 13, 323 B.C of Malaria in Babylon (Iraq) and he was just 32 years old after founding more than 70 cities, created an empire that stretched across three continents, and spread Greek culture and language into new regions. His son from Rhoxana was born after some months of his death. Alexander’s empire collapsed after his death. As a side of Alexander’s empire, the cultures of Greece thrived, which became part of his legacy.